Now that our container loads a note on componentDidMount, let’s go ahead and render the form that we’ll use to edit it. Replace our placeholder render method in src/containers/Notes.js with the following. "Are you sure you want to delete this note?" We render our form only when this.state.note is available. Inside the form we conditionally render the part where we display the attachment by using this.state.note.attachment. We format the attachment URL using formatFilename by stripping the timestamp we had added to the filename while uploading it. We also added a delete button to allow users to delete the note. And just like the submit button it too needs a flag that signals that the call is in progress. We call it isDeleting. We handle attachments with a file input exactly like we did in the NewNote component. Our delete button also confirms with the user if they want to delete the note using the browser’s confirm dialog. To complete this code, let’s add isLoading and isDeleting to the state. So our new initial state in the constructor looks like so. Let’s also add some styles by adding the following to src/containers/Notes.css. Also, let’s include the React-Bootstrap components that we are using here by adding the following to our header. 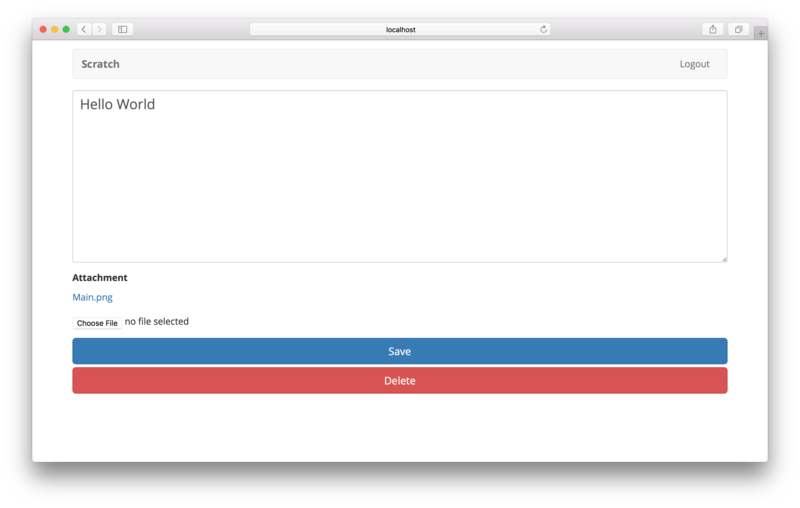 And our styles, the LoaderButton, and the config. And that’s it. If you switch over to your browser, you should see the note loaded. Next, we’ll look at saving the changes we make to our note.